Keeping your prized wines in the right conditions is essential for maintaining their quality. That’s why it’s important to choose the best wine cooler to keep your wines in. You’ll need something that will keep the temperature stable consistently over time. A long-lasting, durable cooler is worth investing in if you care about preserving your wines properly. Other things to consider are how quietly the cooler runs, its capacity, its size and where it will actually fit in your kitchen, how attractive it looks and how it will blend in with the rest of your kitchen. Based around these criteria, we’ve compiled a list for you to choose the very best single zone wine cooler from. So get your favorite wines ready to be chilled and make a toast to a new, handsome additional to your kitchen. 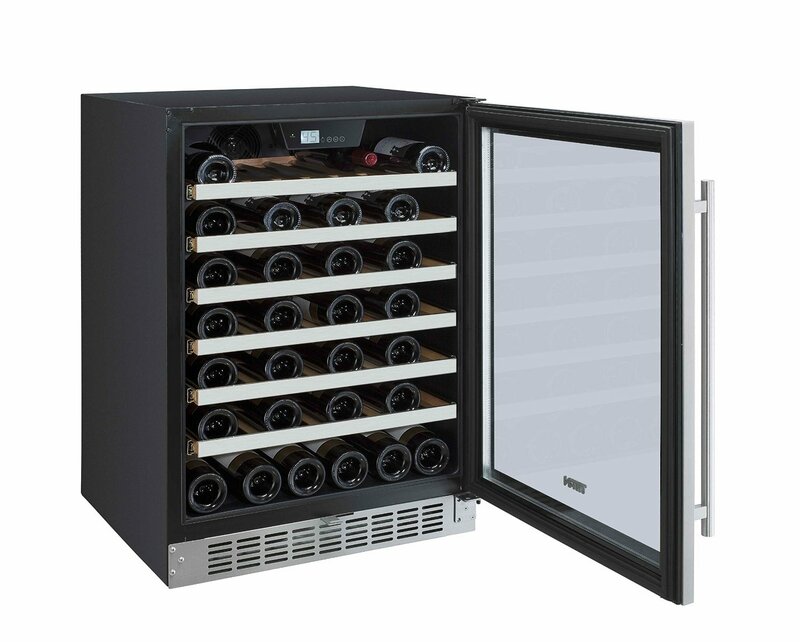 NewAir brings you a 28-bottle capacity wine cooler that is dependable and looks great. The modern design aligns your bottles of wine in apparently organized rows in all directions. This cooler will make your collective assortment of wines appear neat and in order. A blue LED light within the cooler adds a nice glow to attract attention to your already magnetic wine selection. Guests will be intrigued, and will almost certainly mention something about your cooler stocked full of great wines. Why not oblige them with a toast? This sleek, all black wine cellar uses a compressor cooling system to keep your bottles chilled. It features five chrome sliding racks with wooden trim. It can be either free standing or built-in. The unit runs extremely quietly. You can’t really even hear it unless you are standing very close. It has a beverage compartment in the middle so you can use it for keeping other drinks cold as well. 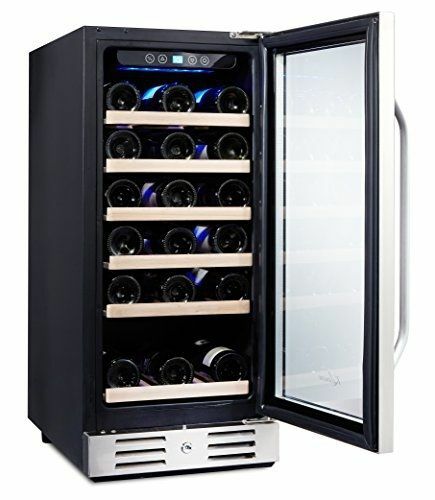 For a 26-bottle wine cellar that functions just as it should, the Haier HVCE15BBH offers great value. 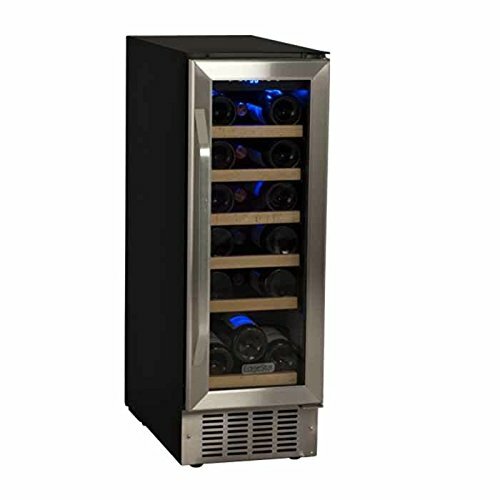 For a slightly smaller capacity wine cooler, Edgestar offers some great options. This 18-bottle built-in cooler looks great once installed in your kitchen. It fits snug underneath a counter, and could easily take the place of a cabinet or row of extra drawers. Of course, it may also be used free standing. When not running, it’s silent, but even when running, the very gentle hum can’t be heard unless you’re standing in the kitchen. Its spacious interior fits bottles with ease and is illuminated by a blue LED light. Edgestar’s wide selection of larger coolers offer great quality as well. As expected with thermoelectric cooling systems, AKDY’s runs very quietly in this 32-bottle wine cooler. Its low energy consumption will save you money on your electric bill. The shelves are adjustable, making it easier to store larger bottles if necessary. Aside from it being a bit sensitive to ambient temperatures if the room you have it in gets too hot, it maintains temperatures well and runs very efficiently. The AKDY AZ-EA44EC-75 is very affordably priced and offers excellent value for the money. 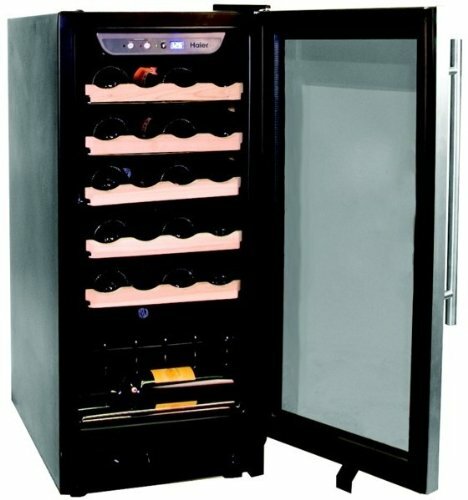 This wine cooler looks very classy and has great overall build quality. It uses a compressor for cooling and runs pretty much silently. It has elegant beech wood racks that easily slide out. The double layered glass used in the Kalamera 15” wine refrigerator helps protect your wine from UV light, and the carbon filter within the fridge prevents any unwanted odors. Overall, this is a very dependable and attractive wine cooler. 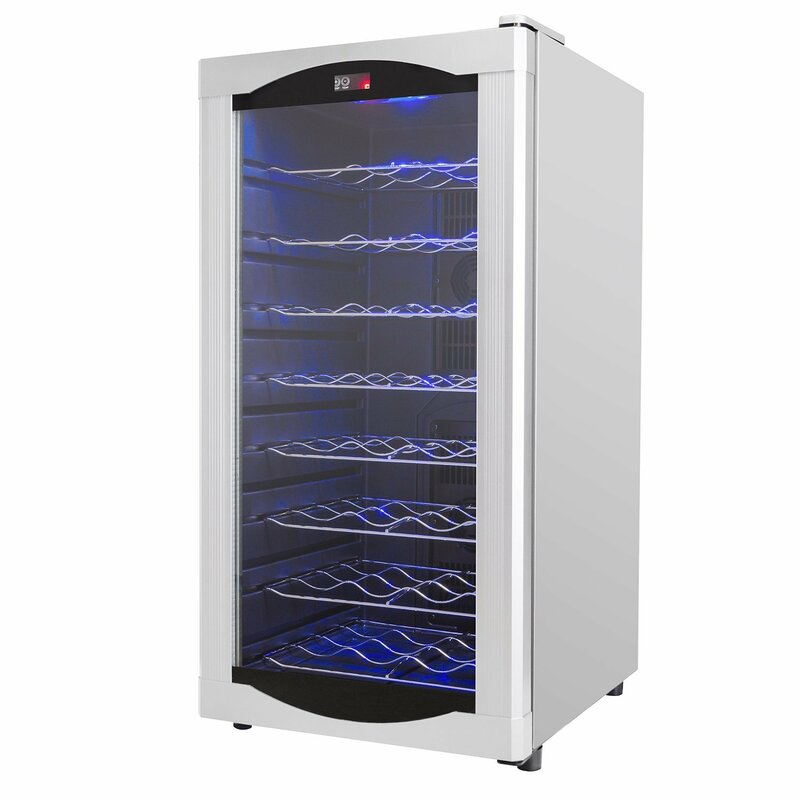 For a higher capacity cooler, Titan’s 50-bottle wine cooler is an ideal choice. It can be free standing or built-in and features wooden shelves with stainless steel trim. There is a safety lock on the door to keep your wines safe and secure. It utilizes a compressor cooling system. Temperature is controlled using a convenient touch screen. Though it fits 50 bottles rather tightly, the overall build quality is superb. This cooler should last the test of time if taken good care of.